Fives will be present at IMTS 2014, a premier event for manufacturing technology. The International Manufacturing Technology Show is the largest display and demonstration of global manufacturing technology in the Western Hemisphere, featuring technologies from all over the world, with more than 1,900 exhibitors and over 350 product categories represented biennially. This event will take place at the McCormick Place Convention Center in Chicago, IL, USA, from September 8-13, 2014. On this occasion, Fives will present ultra precision manufacturing solutions for key industrial markets such as aerospace, automotive, defense, heavy equipment and medical. Fives will showcase its pioneering innovations such as Cinetic and DyAG automation systems, CITCO and Gardner tooling and abrasive solutions, Landis and Giustina grinding & ultra precision machines, and Cincinnati, Liné Machines, Forest-Liné and Giddings & Lewis metal cutting & composite technologies. Join Fives at IMTS 2014 and discover the latest advances in manufacturing technologies. Visit us in booth N-7018 to learn more! 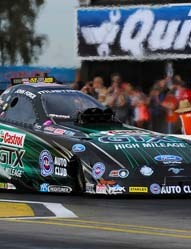 John Force Racing trusts Fives for ultra precision manufacturing solutions! John Force and Robert Hight, Funny Car race champions, join Fives in booth N-7018 to sign autographs September 10, 2014 from 1:00 PM to 3:00 PM. John Force, owner and renowned 16-time NHRA Funny Car champion of the Castrol GTX team, and Robert Hight current NHRA Funny Car points leader and 2009 NHRA Funny Car champion of the Auto Club Team, choose Fives when speed and accuracy count. Fives provides ultimate solutions for the high-performance automotive market, making every second count when the race depends on it. It designs and supplies key automation, cutting tools & abrasives, grinding machines, and metal cutting & composite solutions for engine blocks, transmissions, head and other components from production to aftermarket support allowing it to be the most enterprising partner. Come to booth 7018 in the North hall and discover how Fives’ ultra precision manufacturing solutions can support you! Within Fives, the Automation business line is specialized in the design and supply of complete automated and integrated systems. With a strong foundation based upon renowned range of equipment such as Cinetic assembly solutions and washers, CFC conveyors, efta gantries and conveyors, DyAG software and traceability solutions and North America guiding systems, Fives is recognized as the preeminent provider of outstanding automated solutions and services which are at the heart of its customers’ efficiencies. Fives designs and supplies ultimate grinding solutions for precision component manufacturers in a broad range of industries. With a strong legacy based on 2 major brands of the market – Landis and Giustina, Fives is worldwide renowned for leading-edge automotive camshaft and crankshaft processing systems. Fives is also a leader in centerless grinding and disc grinding processes as well as lean and flexible CNC grinders for a wide range of shaft-type components for various industries. Within Fives, the Metal Cutting & Composites speciality designs and supplies machine tool and complete manufacturing solutions. With a strong foundation based upon renowned brands such as Cincinnati, Giddings & Lewis, Forest-Liné, Liné Machines and Rouchaud, Fives is recognized as the preeminent provider of outstanding manufacturing solutions which are at the heart of its customers’ performance. Key industrial markets served include aerospace, automotive and truck, heavy equipment, oil and gas, rail, wind energy and general machining.